Médecins Sans Frontières (Doctors Without Borders) is a global aid organization dedicated to providing vulnerable populations with free healthcare. Founded in 1971, their aim was to establish an independent organization that focuses on delivering emergency medicine aid quickly, effectively and impartially. Since 1980, MSF has opened offices in 28 countries. Today, MSF employs more than 35,000 people across the world. Since its founding, MSF has treated over a hundred million patients – with 8.6 million outpatient consultations being carried out in 2015 alone. Beginning in September 2016, MSF Europe started the process of harmonizing their messaging systems. A major change to the existing infrastructure, the goal was to move all their users to Office 365 by the end of March 2017. Because the field staff and volunteers needed a local mail program due to the challenges they have finding a reliable internet connection, they were all using Thunderbird as their mail client. The fact that Thunderbird downloaded the mail locally to each PC allowed their field staff and volunteers to access their mail even without an internet connection. But this meant that when a computer was damaged, stolen or lost, all the mail was lost as well. By moving to Office 365 and using Outlook as the new mail client, MSF could keep an archive of mail in the cloud, while enabling their users to work offline. 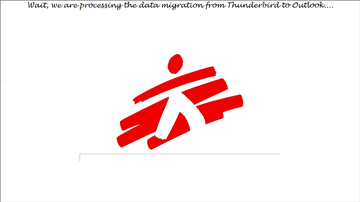 To help them make the move to the cloud, MSF needed to find an email migration tool to move their users from Thunderbird to Outlook. 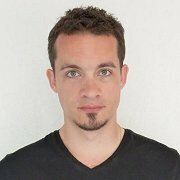 Maxime Callens, from the Geneva Field IT Support Team, was responsible for finding the best tool to help them achieve their project goals. He researched and tested many tools, but the only tool to meet all their requirements was Aid4Mail. One of the highest priorities of the project was to ensure it was as easy and fast as possible for volunteers and field staff to migrate their mail. To achieve this, the IT team at MSF decided they wanted to create a custom interface that would make the migration process simple. In addition, the proposed solution would need to cater to the many MSF sites that have a limited IT infrastructure. Because of the remoteness of these sites, many volunteers’ and field staff’s access to a reliable internet connection was sporadic at best. In some cases, volunteers had no connection to the internet at all. To top off their requirements, the chosen solution needed to be cost-efficient. With MSF dedicated to spending more than 80% of all donations on their humanitarian activities, they needed the best solution, at a reasonable price. To create the custom interface to make the migration as easy for MSF volunteers and field staff as possible, they needed Windows command-line functionality which could be executed within a Windows PowerShell script. To do this they used the Aid4Mail Console (CLI) option in Aid4Mail Migrator. “The command-line execution made it a very easy step for us to integrate the core of the Aid4Mail software within our interface,” said Callens. Once the interface was developed, MSF needed flexible implementation options to migrate all their users’ locally stored Thunderbird archives to Outlook and Office 365. For the users who had at least a sporadic internet connection, a system update containing the migration package was deployed by the MSF IT team. Aid4Mail, along with the custom user-interface was included in this package. At those sites with no internet connection, Aid4Mail Migrator was installed on a USB flash drive which the MSF IT field staff could carry from location to location. They then ran the migration for the user to migrate their mail in down-time. “Aid4Mail made our project easier due to the flexibility of the use of the software and the licensing. If we didn’t have the flexibility that Aid4Mail offered, it would have been a no-go,” said Callens. 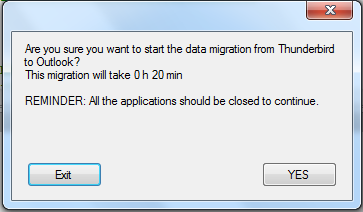 Once the migration package was installed, users could click on a link and see a pop-up containing the estimated time for their migration. If they wished to start the migration, all they had to do is click “yes”. Users were only presented with two options: “yes” or “exit”. This made the migration as easy as possible. After clicking “yes”, users could watch this loading screen to monitor the progress of the migration. Once the migration was complete, the user was notified, and they could continue with their other work. Although they planned 7 months for the entire project, MSF expect the email migration to be finished more than a month before the project deadline. The email migration project took less time than expected because the speed and simplicity of the Aid4Mail solution meant that users were more willing to do the migration. They knew the migration would only take around 30 minutes, instead of the 2-hour time frame they had originally expected. Fast: Many MSF volunteers and field staff are highly skilled medical professionals providing aid in times of crisis. The speed of Aid4Mail meant they spent less time migrating their mail, and more time focusing on patients. Flexible: With varied and challenging requirements, MSF needed a lot of flexibility in the licensing and implementation of their migration solution to ensure even users without internet access could migrate their mail. Aid4Mail offered this flexibility. “Quick and efficient tech support”: As MSF wanted to implement a custom solution based on the Aid4Mail conversion engine for their users, it was important that they received fast and knowledgeable support for technical questions to keep the project moving forward. More than 2 million patients worldwide rely on Médecins Sans Frontières to provide them with healthcare in times of need. It was important that moving from Thunderbird to Outlook and Office 365 took as little time away from their important activities as possible. With Aid4Mail as part of their migration tool set, they achieved this goal.